Today, I had planned to sort out my studio and move a few things around to free up some desk space. The main reason is because it's gotten to that stage of disorder when you have all these ideas to make some art but you can't FOCUS on anything because you can't FIND anything! I'm sure I don't have to tell you that this is NOT the best way to find your creativity. My first distraction was a few paintings that had been drying over the past weeks and needed to be varnished. Now, even though on a normal day this is a job that I avoid, for some reason today, those painting practically varnished themselves and the job was done before I could talk myself out of it. 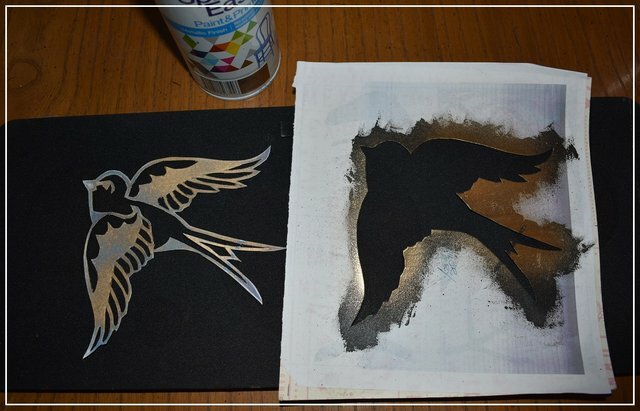 My second distraction came in the form of an unfinished stencil which was the design for the sparrow in the above photo. This was originally cut as a practice piece so I could check if the design would work. Unfortunately, I used a glue that caused the cardboard to warp and of course, this wouldn't sit flat so the block outline didn't stencil very well. 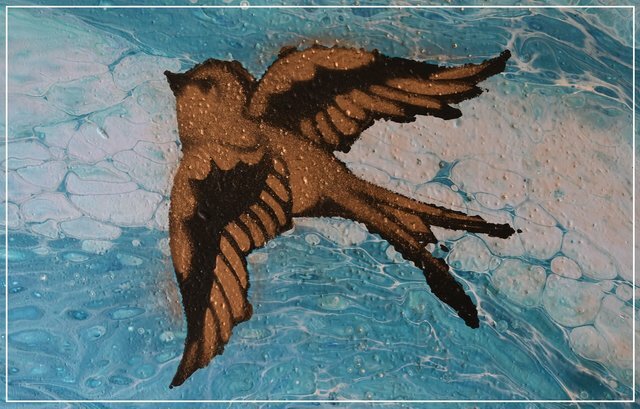 However, a second stencil that was cut from the centre of the main block with extra details for the bird, worked much better and I was able to envision how the final design would look. My third and final distraction for the day, was the small canvas that I've shown as my feature photo. 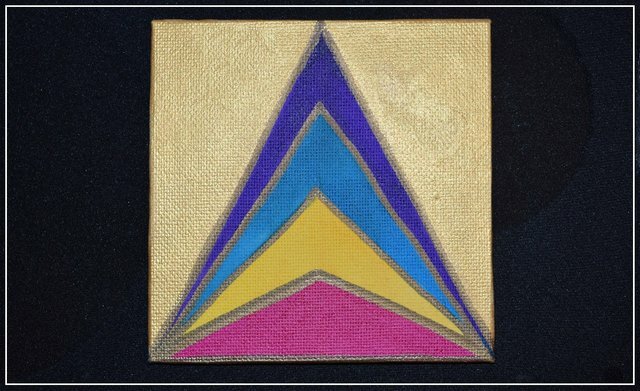 For this piece, I used Artists' Pigmented Ink (which I now know is not the same as Alcohol Ink) in Yellow, Magenta, Turquoise, Violet and Gold painted onto a small 10 x 10 cm canvas using the same fragmented triangle pattern from a previous piece only with a slight variation this time. 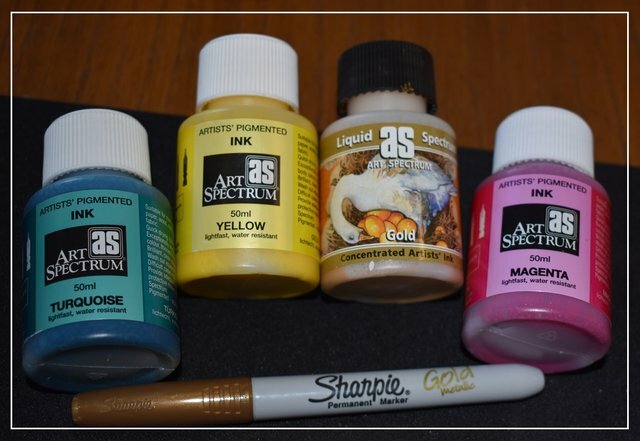 Anyhoo, this post was supposed to be a before and after photo of my messy to clean studio but I guess that can all wait for another day because when the call for creativity comes, as an artist, you just have to answer it...! Thanks for stopping by and reading my post, I really do appreciate your time. And remember to keep smiling, it makes people wonder what you're thinking...! If you enjoyed reading my post, please follow, comment and upvote. All photos, stories and graphics are my own work unless otherwise noted. Hello @alphaccino.art, thank you for sharing this creative work! We just stopped by to say that you've been upvoted by the @creativecrypto magazine. The Creative Crypto is all about art on the blockchain and learning from creatives like you. Looking forward to crossing paths again soon. 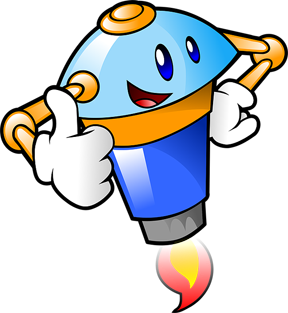 Steem on!